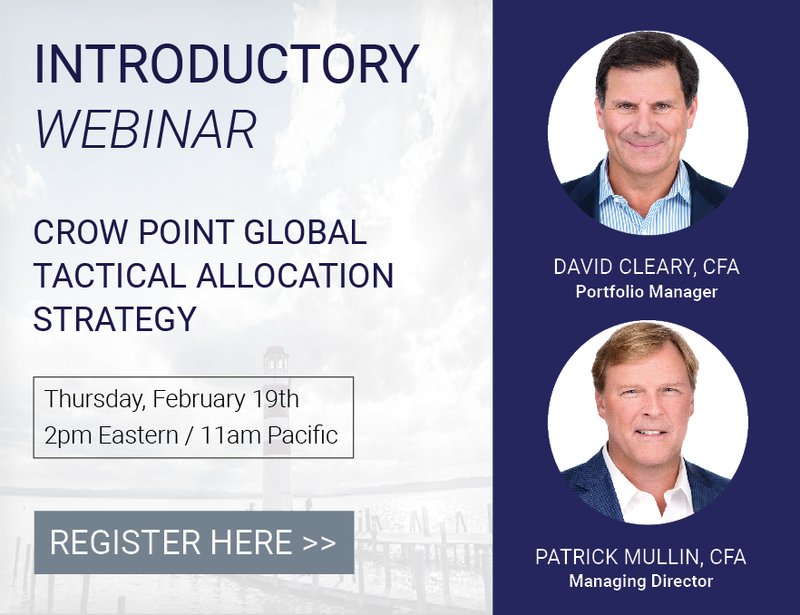 The Crow Point Global Tactical Allocation Fund (CGHIX) seeks superior risk-adjusted returns by allocating capital across a wide variety of global asset classes. • The Fund follows the Crow Point Global Tactical Allocation Strategy which Crow Point have been managing since 2008. Investors should carefully consider the investment objectives, risks, charges and expenses of the Global Tactical Allocation Fund. This is contained in the prospectus, which can be obtained by calling 1-877-244-6235. The prospectus should be read carefully before investing. The Global Tactical Allocation Fund is distributed by Matrix 360 Distributors, LLC, 4300 Shawnee Mission Parkway, Fairway, KS 66205.
movements, resulting in high volatility and potentially significant loss of principal. This is an actively managed dynamic portfolio. There is no guarantee that any investment (or this investment) will achieve its objectives, goals, generate positive returns, or avoid losses. Crow Point Partners, LLC and Matrix 360 Distributors, LLC are not affiliated.